I have managed to use Lego in a professional capacity – mostly in assessment exercises, but also as the basis for a spatial reasoning test. These isolated moments represent the high points of my practice. Everything else is dull and monochrome by comparison. There are 62 pieces of Lego for every person in the world, and I certainly have more than my fair share. What was little more than a passing interest in childhood built into something of an obsession when I had my own children, and I should probably abandon the pretence I am buying it for them. One purchase last Christmas was a book titled The Cult of LEGO (Baichtal & Meno, 2011), and in this I read about Lego-based social development therapy at New Jersey’s Center for Neurological and Neurodevelopmental Health. Personal and professional interest came together, and the foundations were laid for this article. The cement, though, was the feedback from other psychologists when I started sharing the intersect of psychology and Lego on Twitter. Uta Frith (University College London) encouraged me to write an article, saying ‘the idea of a Lego cult is in no way exaggerated’. She even penned her own contribution, a ‘fan letter to Lego’ (see ‘Dear Lego…’). As Roger Highfield (author and executive at the National Museum of Science and Industry) has said, ‘a surprising number of people care about the aesthetic appeal of these little colourful blocks’. But why? And how have these enthusiasts used Lego in their practice, research and teaching? Encouraging this combination of rule-based and imaginative, themed play has made Lego attractive for use in psychological practice. Built as it is on a rule-based, mechanical system, Lego lends itself to therapy with children on the autistic spectrum. More than 15 years ago, clinical psychologist Daniel LeGoff (nominative determinism alert!) saw that children with autism and other neurobehavioural disorders were naturally attracted to Lego when presented with a room full of toys (see www.thecnnh.org/lego.html). LeGoff began using Lego in a therapeutic and structured way in order to naturally reinforce appropriate social behaviour. Then a PhD project at Cambridge University – Gina Owens under the supervision of Simon Baron-Cohen (Owens et al., 2008) – gave 6- to 11-year-olds with high functioning autism either Lego therapy, the Social Use of Language Programme, or no intervention. After one hour a week building in pairs or small groups, for 18 weeks, the Lego therapy group had improved more than the other groups on autism-speci?c social interaction scores, and interacted with others in the playground for longer. Gina Owens, now Gina Gomez and a Research Psychologist at the University of Cambridge and Cambridgeshire and Peterborough Foundation Trust, picks up the story. ‘The groups were a success – the children enjoyed it, benefited in terms of their social skills – though there were lots of individual differences – and parents were very satisfied that children could attend a social group that they didn’t find anxiety provoking or stressful.’ But were the benefits specific to Lego? Lego therapy is now worldwide, with organisations such as ASD Aid (http://asdaid.org), run by adult fans of Lego, organising events in Australia at which thousands attend to learn how ‘to help children with autism spectrum disorders communicate and grow’. Not everyone is convinced though. Jean Ruttenberg, of the Autism Center in Philadelphia, says Lego therapy won’t help children with more complex cases of autism. She says that LeGoff won’t include children with behaviour problems. ‘Those make up the majority of children with autism, and the ones we struggle with every day,’ Ruttenberg says. She would like to see more extensive studies before adding it to treatments at her centre. Back in 1995 the Lego company observed that children were starting to play differently. ‘Growing older younger’ was the term often used, and Lego felt a new strategy was needed. Finding the results of their internal sessions decidedly unimaginative, the group called in business consultants to research how building with Lego could be used to ‘tap unconscious knowledge’ and create strategy as ‘something you live as opposed to something stored away in a document’. However, it was not until psychology graduate Robert Rasmussen was involved in 1999 that ‘the work moved into developing the process itself… to make the results reproducible and the methodology robust’. The first ‘Lego Serious Play’ facilitators were trained in 2001, and the product was made open source in 2010. The Lego Serious Play method has also found its way into psychological research. In 2011 a two-day experiment conducted by the LEGO Learning Institute, MINDLab and Aarhus University (including UK psychologists Chris and Uta Frith) investigated the impact of collaborative behaviour on the heart and brain. 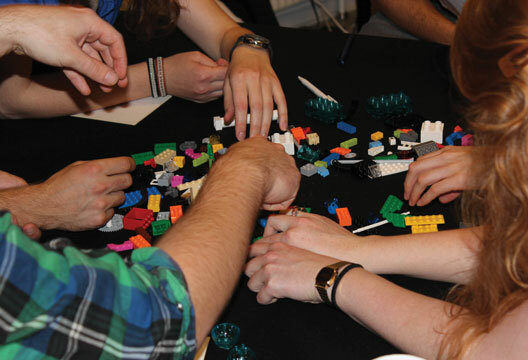 Summer-school students from 15 countries used Lego bricks to build, discuss and align their understanding of key concepts associated with leadership and social capital. The research team hypothesise that collective building processes will lead to stronger heart rate synchronisation among participants, and greater activity in the social areas of the brain. Also getting under the skin with Serious Play is David Gauntlett (University of Westminster). ‘Making things and then reflecting on them and telling a story about them is a great way of getting people to assemble their knowledge, thoughts and feelings about something,’ Gauntlett says. ‘I’m looking at how we can use the process to explore identities. So people are asked to build a model which represents their personal identity – who they are and what they bring to the world. Then we also build influences on their identities, and explore those connections.’ Find out more at www.artlab.org.uk/lego.htm. to have with it, and creating imaginary worlds of which it is part.’ And in as yet unpublished research, Miles Richardson at the University of Derby is using Lego building skill as a predictor of mathematical and spatial abilities. But it’s not just for kids. Lego has been used in an adaptation of Piaget’s famous ‘mountains task’ for adults, finding a strong correlation between overall social acumen and the study participants’ accuracy in taking another spatial perspective, but only when the viewpoint was that of a figure, rather than a toy camera or triangle (Shelton et al., 2011). It has revealed the ‘curse of expertise’, in a study which showed that experts at building Lego Star Wars models underestimate the time needed for a novice to do the same thing (Hinds, 1999). A study of the influence of perceived meaning on our willingness to work made use of Lego (Ariely et al., 2008). Lego even found a place in a study which found that ‘fertility cues lead committed men to devalue relationship alternatives’ (Miller & Maner, 2010). Even the animal world doesn’t escape. Need to uncover risk behaviour in foraging rats? Bring in the Lego (Choi & Kim, 2010). Nicky Clayton’s group always use Lego to study episodic-like memory in scrub jays: ‘I use the Lego bricks to make each ice cube tray visuospatially distinct and thus allow my birds to bury their food in different trays at district times. This allows me to assess how good they are at remembering which caches they have hidden where and when’ (see, for example, Clayton & Dickinson, 1998). And why not have octopuses get to grips with Lego (Kuba et al., 2006), to tackle the phylogenetic origins and function of play? Perhaps most interesting, though, is research using Lego that could reveal why people value their Lego creations. In a paper ‘The IKEA effect – when labor leads to love’, a team led by psychologist Michael Norton (2011) investigated the counter-intuitive notion that having to put effort into producing something yourself can actually increase your willingness to pay for it. Participants valued their Lego helicopters, ducks, dogs or birds more when they had built them compared to when they received prebuilt sets, or when they built and unbuilt them. The authors suggest that ‘building products increases both thoughts about the positive attributes of that product… and positive affect and emotional attachment to that product’. In addition, the authors argue, self-assembly of products may allow people to both feel competent and display evidence of that competence – their creation – thereby ‘signalling desired attributes’ to themselves and others. Personally, I suspect that displaying my ‘creation’ would only signal to my other half that I was entering midlife crisis, but Norton’s point has solid foundations. Other toys do find their way into psychology. For example, William Farr and Nicola Yuill of the University of Sussex are doing fascinating work with Steve Hinske at the Institute for Pervasive Computing in Zurich, using an augmented Playmobil Knight’s Castle. They have added a wireless networking system and radio frequency identification tags, allowing the Playmobil characters to speak or make different sounds when they are placed in different locations. The adaptations can improve understanding of and interest in the play set, and boost the level of social interaction and play with other children (Farr et al., 2012). Farr and Yuill even teamed up with Hayes Raffle, the developer of Topobo, a construction system embedded with programmable memory. In a small sample of children with autism, they found more social forms of play with the Topobo than with traditional Lego (Farr et al., 2010). There’s even a ‘senior builder’, Dave Specha, making use of his psychology degree at a Legoland Discovery Centre (see tinyurl.com/79nwprf). There’s hope for me yet! - Jon Sutton is Managing Editor of The Psychologist. If you have used Lego or other play systems in your professional life, do get in touch and see @legopsych. Whether it’s Richard Wiseman (University of Hertfordshire) and his Lego visual illusions, Niall Canavan explaining sampling in psychology via Lego (see tinyurl.com/7nd6pck) or Chris Moulin (University of Leeds) and his Lego brain (see tinyurl.com/7f8ozyy), there’s no shortage of psychologists out there making use of Lego in their teaching. Others have used Lego to explore concepts of civic participation, linked to the theories of Solomon Asch and Stanley Milgram (see tinyurl.com/78al4yn), or as a medium for teaching, learning and research in the psychology of creativity (Pike, 2002). Beyond the brick, the Lego Mindstorms kits, containing software and hardware to create small, customizable and programmable robots, seem to lend themselves to psychology. Perhaps this is not surprising given that they grew in part from research by developmental psychologist Edith Ackermann (Massachusetts Institute of Technology). ‘I have worked with the Lego groups on a regular basis since 1986,’ she tells me. When I moved from the Piaget Institute in Geneva to work with Papert at the Epistemology and Learning Group, MIT Media Lab, I was interested in “children as cyberneticians” – the genesis of their views on control and communication in humans, animals and machines – and their views on agency and intelligence in humans, animals, and machines. Bringing Lego and the LOGO programming language together was a good marriage, offering an excellent entry point to learn about how the kids themselves think about AI, smart machines, and what not.’ Psychologists now use Ackermann’s developments to teach about the scientific method (see Tom Stafford’s account of work at the University of Sheffield, at tinyurl.com/6quqrtq), and galvanic skin response (www.extremenxt.com/gsr.htm). What is it about you, Lego? I feel the pull of two opposites: my incurably romantic side that is longing for anything miniature, childlike and playful, and my totally nerdy side that craves collecting, dissecting, and exploring. Lego, you make the perfect marriage between these worlds. This is why I am your natural born fan. From the first encounter I could not resist your Mondrian-like hard edge, primary colour, and at the same time sweet and lovable pieces. I love the sensory pleasure of the feel and sound of the bricks, so clean and exact. What could be more satisfying than the sound of little bricks clicking together and the characteristic sound of burrowing in a full box. You feel reassuringly firm yet light. There is the thrill of the sheer abundance of combinatorial possibilities you provide. Then there is the joy of a new start every time I break up some previous construction, and it is allowed to be both sense and nonsense. Here is one of my secret joys when rummaging in seemingly inexhaustible quantities of colourful elements: I am making lovely little modules that can be inserted in ambitiously complex structures, and it feels just like building models of the mind. I become dimly aware of replicating structures as I watch my grandchildren getting absorbed in Lego play. They’re only toddlers now, but soon they will show their own children how to click the bricks together and pull them apart again. Will they be using the same bricks? I hope so. Recycle and recombine. For me you are one of those legends that transcend change in fashion and leaps in technology. Just like your abstract cousin, language, you continuously re-use and reinvent your elements. You have long started to import more and more semantics by offering me little people and little symbols as pre-prepared play elements. At first I was afraid this would destroy the purely abstract qualities of the game, but soon it became irresistible to connect a tiny Darth Vader incongruously with a flower. I also admit to being amused by the idea of ‘Serious Play’. Pinstriped kits for the board room and the executive office? Permission to be creative when no longer a child? I have never needed an excuse for play. After all, according to Einstein, play is the highest form of research. I don’t even need my own special box of elements – as in research it is best to share and to re-use. Ariely, D., Kamenica, E. & Preleca, D. (2008). Man’s search for meaning: The case of Legos. Journal of Economic Behavior & Organization, 67, 671–677. Baichtal, J. & Meno, J. (2011). The cult of LEGO. San Francisco: No Starch Press. Clayton, N.S. & Dickinson, A. (1998). Episodic-like memory during cache recovery by scrub jays. Nature, 395, 272–278. Farr, W., Yuill, N. & Raffle, H. (2010). Social benefits of a tangible user interface for children with Autistic Spectrum Conditions. Autism, 14, 237–252. Farr, W., Yuill, N. & Hinkse, S. (2012). An augmented toy and social interaction in children with autism. International Journal of Arts and Technology, 5, 104–125. Hinds, P.J. (1999). The curse of expertise: The effects of expertise and debiasing methods on predictions of novice performance. Journal of Experimental Psychology: Applied, 5, 205–221. Kuba, M.J., Byrne, R.A., Meisel, D.V. & Mather, J.A. (2006). When do octopuses play? Effects of repeated testing, object type, age, and food deprivation on object play in Octopus vulgaris. Journal of Comparative Psychology, 120, 184–190. Miller, S.L. & Maner, J.K. (2010). Evolution and relationship maintenance. Journal of Experimental Social Psychology, 46, 1081–1084. Owens, G., Granader, Y., Humphrey, A. & Baron-Cohen, S. (2008). LEGO therapy and the Social Use of Language Programme: An evaluation of two social skills interventions for children with high functioning autism and Asperger syndrome. Journal of Autism and Developmental Disorders, 38, 1944–1957. Pike, C. (2002). Exploring the conceptual space of LEGO: Teaching and learning the psychology of creativity. Psychology Learning & Teaching, 2(2), 87–94.